Floyd Mayweather and Manny Pacquiao have decided to put in another night's work ... a night that will produce a 9-figure payday. Floyd says he and Manny will have a rematch later this year, saying, "I'm coming back to fight Manny Pacquiao this year another 9 figure pay day on the way." It's not like Floyd needs the cash ... he made around $220 mil from his 2015 fight against Manny. Money Mayweather added to his 401k to the tune of $275 mil with his Conor McGregor fight last year. Floyd's 50-0 and it sure seemed like the stat was right for hanging up the gloves, but $$$ is $$$. 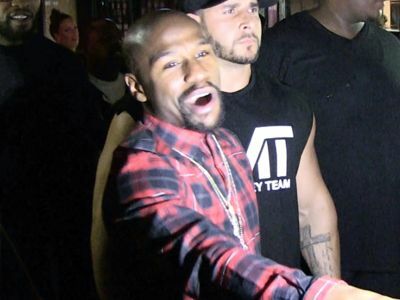 The video (above) was shot Saturday at a Tokyo concert ... where Floyd and Manny are together. Kinda funny ... they clearly don't hate each other, but are willing to beat the living daylights out of each other for a price ... and the price is right. The first time around, Floyd won in a unanimous decision. Most people called the fight boring.